What do I do now that I have finished high school? This is a hard decision facing many young people right now. As part of our recruiting efforts, we speak with many high school students and guidance counselors every year. I always start with the same question: who wants to be a plumber, electrician, carpenter, or HVAC technician? I usually see very few hands raised. My next question is what do you want to be? I seem to always get the same responses: engineer, architect, doctor, lawyer, casino manager. While I applaud these students for their lofty goals, I wonder to myself if they have looked at the cost and time involved in training and, most importantly, the salary and job outlook for their planned career. When I ask students about those things, most have no idea of the forecast growth and starting salary for the career they have chosen. This make me wonder how such highly intelligent students can commit a minimum of four years of their lives and thousands of dollars for training for a career in which they may never be able to get a job. I realize that not everyone has the mental capacity for a career as tradesperson, but I think that many do, so it disturbs me that they are planning to waste a lot of time and money on education for career that may never even take off. They are making choices without even considering their options. We have had several successful graduates from our programs that came to us because they could not find jobs even though they held a bachelor’s or master’s degree. We have programs where, in as little as sixteen weeks, we can prepare a student for a rewarding career, a career that has an expected job growth of more than 20% and a median pay of about $20-25 per hour. 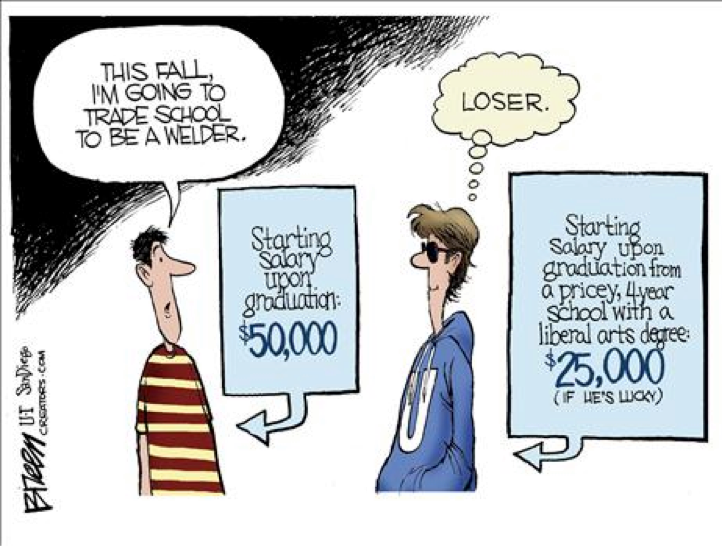 I’ve had many students ask how much money they could make in the trades, and my reply is always, “How much do you want to make?” There are many very wealthy business owners that got their start at a technical college. We just ask that you consider all your options before making a decision that will affect the rest of your life.